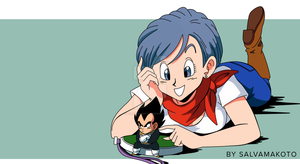 This is my Bulma. There's no one else like her, she is mine. Without me, she is useless. Without her, I am useless. I really do love their super designs. Great job by the way. Your art always looks like it should be in the show or on the promotional artwork. Your arts are quite famous among French community now ! Good work dude ! Drawing is different from animating lol. omg i love this! So cutE! 83,7?? jaja, esta muy bien!